The Crimean War was, in many senses a war fought throughout the world between seveal of the most powerful nations on Earth. The British Empire, the newly recreated French Empire, the Turkish Ottoman Empire, along witht the smaller Kingdom of Sardinia , battled against the huge Russian Empire. While the bulk of the ground fighting took place in the Russian Crimean Peninsula (from whence the war's name originates), combat also occurred in the Ottoman-controlled Balkans, along the Russian-Ottoman Caucasus border region, in the Russian Far East, and naval combat took place in the Baltic Sea, the Black Sea, and the western Pacific Ocean region. The Crimean War was publicly about control of the "Holy Lands," but was really about geopolitics and diplomatic/military strategy. Russia sought to chip away at Ottoman control of the Balkans and other areas, and sought to use the sensitive issue of the Muslim Ottomans' control of Jerusalem and other areas holy to both Christians and Muslims. Historians consider the Crimean War to be one of the first truly modern wars for several reasons. New technologies, and new ways to apply existing technologies to warfare were pioneered in the Crimean war. These modernities includied the first tactical use of railways to transport troops, and the use of the electric telegraph to improve communication between the national leadership of Britan and France to the battlefield commanders in far-off Crimea. The Crimean War also saw an improvement in the care of wounded and ill soldiers through the work of Florence Nightingale and Mary Seacole, two nurses who pioneered modern nursing practices in the British Army. In terms of new weapons technology, the British and French used the new rifled muskets, thereby increasing accuracy and the deadliness of their fire. The public back home in Britain were more engaged and informed in this war due to the work of what we now call the news media, in the written reports and photographs of combat submitted by journalists such as William Russell (for The Times newspaper) and Roger Fenton. The Crimean War Began: The Ottoman Empire declared war on Russia on October 23, 1853. France and Britain formally declared war on Russia on March 28, 1854. 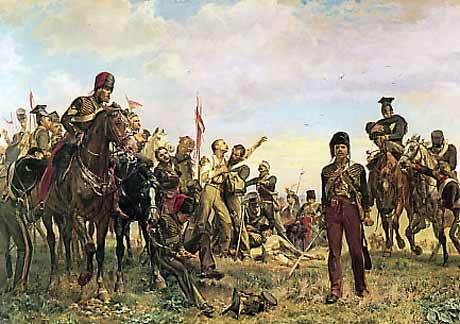 The Crimean War Ended: March 30, 1856, with the signing of the Treaty of Paris. The Crimean War Also Involved: Rebels in Greek-populated parts of the Ottoman Empire's Balkan territories staged rebellions against the Ottoman Turks during the Crimean War. In the Russian-occupied Caucusus region, Chechen rebels led by Imam Shamil rebelled in 1853 and 1854. The Crimean War Resulted In: Allied victory.